Enjoying a corporate or leisure trip to San Francisco couldn’t be better when you choose to charter a private jet with Bolt Jets, a company renowned for premium service. Travel in style is one of our favorite mottos and with over 1,200 jets available there’s something to suit every occasion. Bolt Jets offers affordable, comfortable private jet charters in San Francisco and we understand the importance of excellence. Our concierge team is second to none, guaranteeing 24/7 accessibility and always go the extra mile to make sure every trip is absolutely perfect. Imagine seeing the Golden Gate Bridge in all its glory from the skies! So whether a private jet rental in San Francisco is required for a wedding, bachelor party or for an important business meeting, look no further than Bolt Jets. No one wants to arrive at a business meeting in San Francisco late or flustered and using Bolt Jets makes sure arrival is spot on, often with plenty of time to spare. Why put up with stressful large passenger aircrafts or busy roads when Bolt Jets promises a superb flight experience with all the trimmings. Organizing a Bolt Jets San Francisco charter flight is easy and simply. Contact the Bolt Jets concierge team to tailor the best journey possible. Often referred to as The Golden City, San Francisco is renowned for its rolling golden hills, the famous Golden Gate Bridge and its glorious sunsets…so take good shoes because there’s a lot of walking in this vibrant city! Don’t miss out on Fisherman’s Wharf especially early in the morning because that’s when it’s quiet enough to really take in the bay’s views. 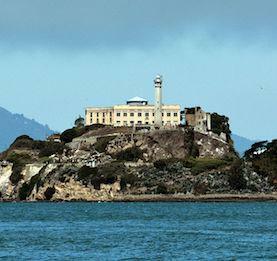 Then climb on the Alcatraz tour which departs from Pier 33 and go across the water to see the infamous jail, home to convicts Capone and Birdman (amongst others). Love a little luxury? Pop over to Pacific Heights, home to the upper class of San Francisco with incredible views of the Golden Gate Bridge. For shopping, head down to Fillmore Street, where there is a treasure trove of designer boutiques to explore. Then head over to Alamo Square where The Painted Ladies live, a row of colorful Victorian houses and the most photographed scene in downtown San Francisco. 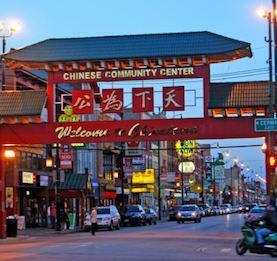 San Francisco is home of the oldest China Town in North America and no visit to the area is complete without exploring the wonders of this part of Frisco. Buy gifts, herbs, delicacies and trinkets or enjoy a delicious Chinese meal, made the proper way! The most famous landmark in San Francisco has to be The Golden Gate Bridge, a magnificent 1.7 mile long bridge that seems to go on forever. For the very best views, see it on-board one of Bolt Jets fleet at sundown and witness the most unbelievable sunset from the sky. There’s something for everyone in this city, Italian food lovers will adore Delfina which is wonderfully simple and full of gorgeous pasta dishes to whet your appetite. The carnivores out there won’t eat better beef than at the House of Prime Rib which has been going strong since 1949. For cheaper eats and for sea foodies try the Swan Oyster Depot, another old-timer in the city that serves Dungeness crab, oysters and only $5 bowls of Chowder – yum! Too busy to try out the best eateries in San Francisco? Speak to our dedicated concierges team to arrange for dinning options from your choice of any San Francisco restaurant during your charter flight out of San Francisco. 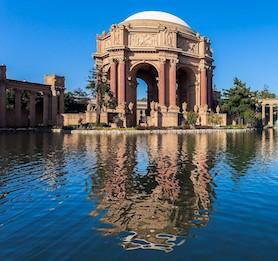 Planning a corporate trip to San Francisco? For a corporate trip to San Francisco to remember, let Bolt Jets plan every little flight detail for you. Our team pride themselves in knowing all there is related to corporate travel and can advise on the right private jet to suit your needs. They can also take care of other details such as onward journeys, transfers and accommodation in the very best hotels in San Francisco. There are different airport options when chartering private jets to and from San Francisco.